Maryland crab cakes are a little different from what you may be used to. 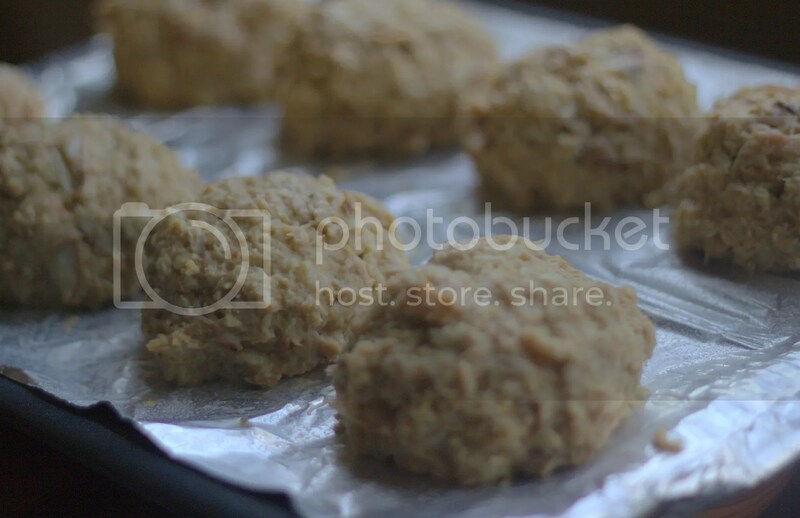 They’re made with a smidgen of bread crumbs (or sometimes crushed crackers) which give them a slightly spongy consistency, unlike many of the hard-packed crab cake balls I’ve seen elsewhere. 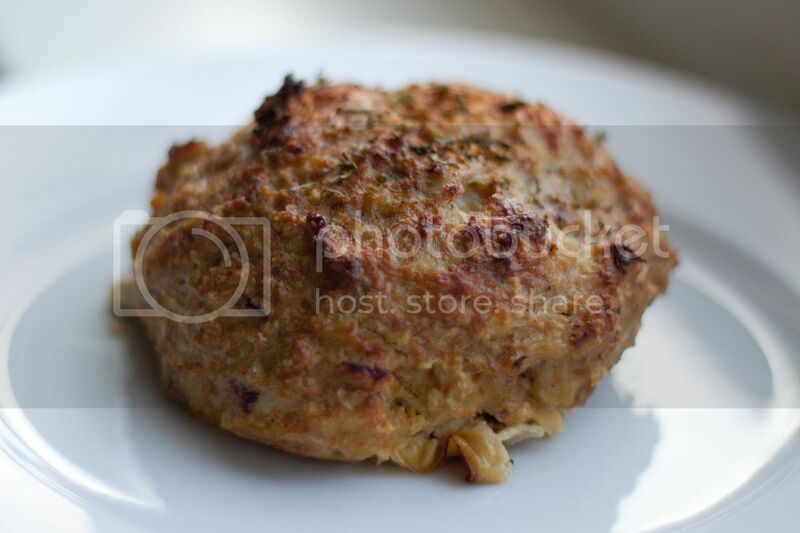 Also, Maryland crab cakes don’t have any onions in them; they’re basically just huge piles of crab meat. Here in Maryland crab cakes are either fried or broiled, and I prefer the broiled method. 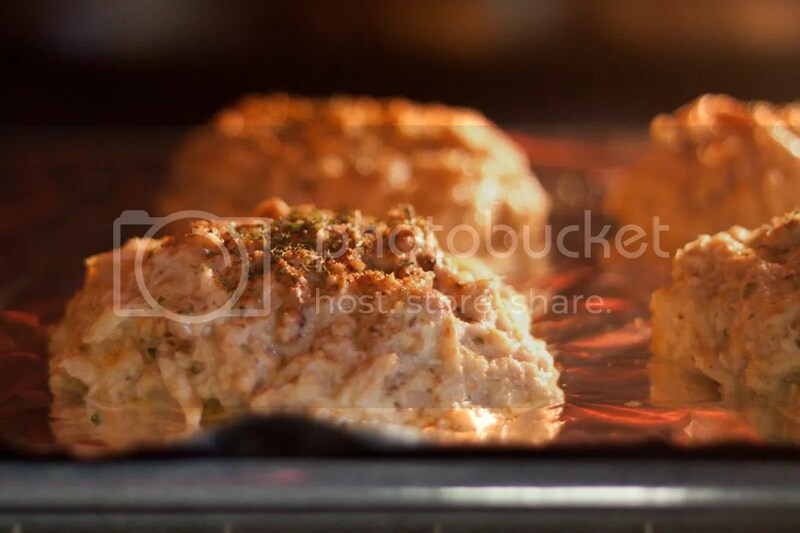 I’ve seen a lot of recipes which call for baking then broiling the crab cakes; however, the internal temperature of a crab cake should be 160 degrees, so this method doesn’t seem very practical. I imagine it’s hard to guess the perfect temperature while a crab cake is being broiled at 500 degrees. Instead, I’ve chosen to broil the crab cake first to get the right crispiness, then bake it until it reaches the right temperature. Lastly, for the bread crumbs I used Udi’s gluten free bread, which is made with tapioca starch, rice flour, and potato starch. I lightly toasted two slices of bread (this is a great use for the heels) and then blended them in my Magic Bullet. Worked perfectly. If you don’t have access to Old Bay, you can make something similar with 1/2 tsp celery salt, 1/2 tsp paprika, 1/4 tsp mustard powder and 1/4 tsp white pepper. 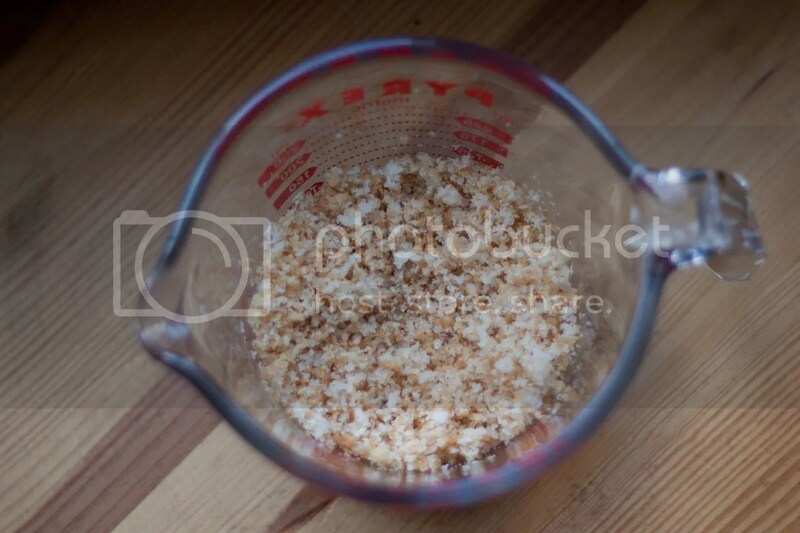 Combine the eggs, mayo, mustard, lemon juice, white pepper, worcestershire, and 1 tsp of the Old Bay. Mix together until the eggs are beaten and everything is a little frothy. 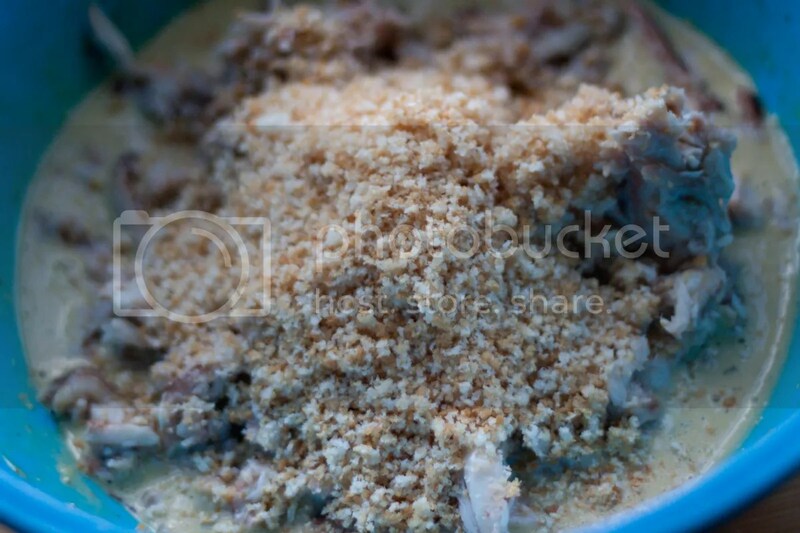 Add the crab and breadcrumbs, and mix together gently with your hands, being careful not to break the crabmeat up. Form the mixture into four large clumps (about the size of a baseball) and place on a broiler pan lined with tin foil (and sprayed with coconut oil – yeah, they sell that). Sprinkle the other 1/2 tsp of Old Bay and parsley on top. Refrigerate for 30 minutes to help keep their shapes. Place your oven racks so that one is on the top and one is on the bottom of the oven. Broil on the top rack for a few minutes, until the top starts to get crusty. Switch the oven heat to 425 degrees and move the pan to the bottom rack, and bake until the internal temperature reads 160 degrees (about 10 minutes). Let rest for five minutes before serving. If you don’t have a kitchen thermometer, I suggest the ProAccurate thermometer. It reads temperatures in seconds, it’s great. We bought it because it came recommended from America’s Test Kitchen. Cooking with a thermometer also takes out a lot of the guesswork when working with delicate dishes like this one.